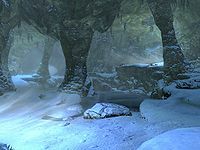 Cold Rock Pass is a small passage through a mountain northwest of Whiterun. The pass is guarded by a high level troll. 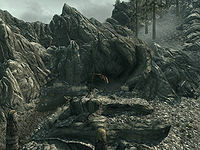 The mountain is Eldersblood Peak, a dragon lair where a word wall for the Disarm dragon shout is located. To locate the entrance from the north, follow the path towards Eldersblood Peak, when you pass a banner attached to a post on your left, the entrance is found on the next switchback to the left. There is an orichalcum ore vein slightly further downhill from the entrance and several snowberry bushes in the vicinity. Upon entering via North Cold Rock Pass you enter a natural cave system heading down and to the west. Ahead there is a wooden crate with a skeleton, which can be looted, lying beside it along with a sack of food. To the south, to the left of an earthen ramp leading up is a corundum ore vein. At the top of the ramp the cavern opens up in front of you with a couple of rock pillars supporting the ceiling and a frozen pond of water being fed by a small waterfall. To the southwest of the waterfall on a higher ledge is a frost troll. The ramp leading up to it is along the northwest wall of the cavern. The ledge where the frost troll is has a quicksilver ore vein on the southwestern wall of the cavern. Among the bones and blood splatters on the ground are some poor quality iron or steel weapons and a dead skeever or two. There may be the body of a bandit by the edge, although this may have fallen off and be laying on the ice below. Near the troll, there is a body of a dead elk and a chest with the lid wide open containing a set of random armor, a steel sword and two potions of minor healing. To the south, below the ledge is a large shallow pond, that is mostly frozen over, with the path through the cavern beside it. Against the east wall, opposite the waterfall is a food barrel next to an unlocked chest containing minor loot. At the southern end of the pond there is a second corundum ore vein, with a ramp up to the left of it leading past a cart containing a food barrel with a second barrel beside it along with a second skeleton to be looted, to the southern entrance. If you are starting from the southern side, South Cold Rock Pass entrance is found by going up the stone stairs outside and to the left of the entrance of Rannveig's Fast. Right by the southern entrance is the body of another dead skeever. There are two separate map markers for this location on the map, South Cold Rock Pass and North Cold Rock Pass, and therefore finding both entrances to the pass counts as two separate locations for the "Locations Discovered" statistic. 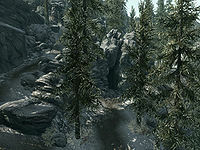 This issue has been addressed by version 2.1.1 of the Unofficial Skyrim Patch; it has been set to be part of Hjaalmarch instead. This page was last modified on 7 January 2019, at 04:56.